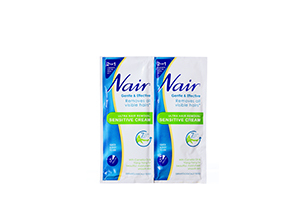 Nair Sensitive Hair Removal Cream Sachet is the perfect travel size and is suitable for dry and sensitive skin. Clinically & dermatologically tested, the formula is gentle enough to use on legs, bikini and underarms. Enriched with moisturising camellia oil and a protecting ylang ylang extract to gently but effectively remove hair as well as nourish the skin leaving it soft and smooth to the touch. This makes your legs soft and smooth, no fuss, no pain, no blades, softer legs is what every woman wants. With all the rich moisturizing in this product, you will be guaranteed soft and smooth skin.